New Brewers will find a host of help and savings at BREW Cellar! If youÃ¢â‚¬â„¢re new to Home BrewingÃ¢â‚¬Â¦maybe starting to think about giving it a goÃ¢â‚¬Â¦or starting again after giving it upÃ¢â‚¬Â¦there are a number of compelling reasons to get into your nearest BREW CellarÃ‚Â stockist Ã¢â‚¬Å“Fast”! First of all thereÃ¢â‚¬â„¢s the savings to be had when you brew your own. You donÃ¢â‚¬â„¢t need to be Ã¢â‚¬Å“EinsteinÃ¢â‚¬Â to figure out how much money you can save when you brew your own beer from as little as 25c a stubby! Then thereÃ¢â‚¬â„¢s the quality! The beer you brew yourself is fresh, you know what goes into it, itÃ¢â‚¬â„¢s natural and chemical freeÃ¢â‚¬Â¦oh, and did we mention how much youÃ¢â‚¬â„¢ll save? And, of course, thereÃ¢â‚¬â„¢s the fun, enjoyment and feeling of accomplishment you get when you find out how easy and fast it is to brew beer this good, right in your own home. Home Brewing these days is much less of a science and much more of an enjoyable project you can share with family and friends! The Beer Kits, equipment and accessories available from your nearest BREW CellarÃ‚Â stockist are better, more modern and procedures much more refined than ever before. A simple, fast and highly enjoyable batch of beer is the inevitable result! Start right and youÃ¢â‚¬â„¢ll get the right finish. The logical place to start your new brewing adventure is at your nearest BREW Cellar stockist, because their years of experience and tons of expertise will make all the difference! They will be able to back this advice with access to the best ingredients and the right equipment at the right price to make sure you have a very positive result every time. 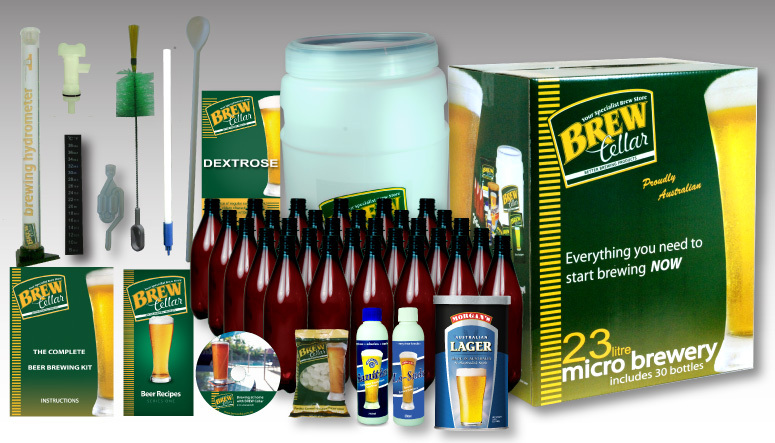 Ask your local BREW CellarÃ‚Â stockist about ourÃ‚Â awesomeÃ‚Â 23ltr Micro Brewery Starter Kit. YouÃ¢â‚¬â„¢ll see it there in the sparkling Green & Gold livery that tells you itÃ¢â‚¬â„¢s a genuine BREW Cellar product.